Could An Older Truck Driver Be More Likely To Cause Your Truck Wreck? With the downturn in the economy and fewer people saving enough for retirement, more people are working well beyond their 65th birthday. In addition, as the economy has improved, the trucking industry has faced a severe shortage of truck drivers. Not surprisingly, many older Americans are turning to truck driving as a second career. What Are The Dangers Of Older Truck Drivers? Reduced vision. 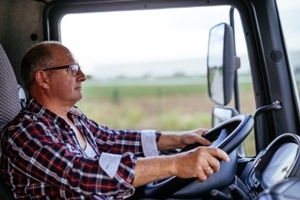 Older truckers could have poor vision, making it harder for them to see other vehicles, especially at night when visibility is already difficult. Reduced hearing. If an older trucker has problems hearing, he may not hear the warning signs of a dangerous driving situation up ahead. Reduced motor control. When a trucker has reduced motor control, he cannot move quickly enough to respond to poor weather conditions, slowing traffic, or another wreck he needs to avoid. Impaired reaction time. An older trucker can have a slower reaction time, which could mean that he cannot react quickly enough when he needs to avoid causing a collision. Drowsy driving. Truck drivers can drive 11 hours without a break under Federal Motor Carrier Safety Administration (FMCSA) rules and often drive longer when violating hours-of-service-rules. An older driver may become drowsy or fall asleep at the wheel long before he has driven his 11 hours, with disastrous consequences for other drivers and their passengers. Medical problems. An older trucker could be more likely to have a medical condition, such as heart disease or a respiratory illness, which could impair his ability to drive safely. Proving that a truck driver’s age contributed to his negligent driving and your truck accident requires the assistance of an experienced truck crash attorney. If you or a loved one was injured in one of these wrecks contact us, start an online chat or call our firm directly at 817.380.488 to schedule a free, no-obligation consultation. How Long Will It Take My Truck Wreck Case to Settle?